Now that’s a FULL skirt! Proper circle skirt from the 1950s actually. What am I wearing? Red and white to match my peppermint bark popcorn! This is a traditional staple of the season in our household, generally accompanied by watching The Grinch, A Christmas Story, or Christmas Vacation. Melted white chocolate drizzled over fresh popped corn, shaken in a bag with crushed candy canes. Spread out on wax paper to set. Eat it all! I dare you not to eat it all! I want to shove it all in. 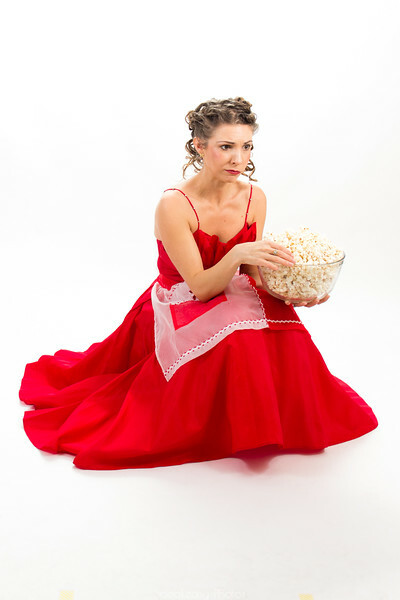 Hmm…I could hand over the bowl to go dance, or I could sit here and eat my popcorn.